When pumpkin season finally rolls around, you can't help but get goosebumps thinking about pumpkin spice lattes, pumpkin cookies and most importantly, hand-carved pumpkins. You might good, old-fashioned Jack-o'-Lantern, but it's fun to be more innovative. From superheroes to super cool, these 25 unique pumpkin carving ideas will spark your creativity. 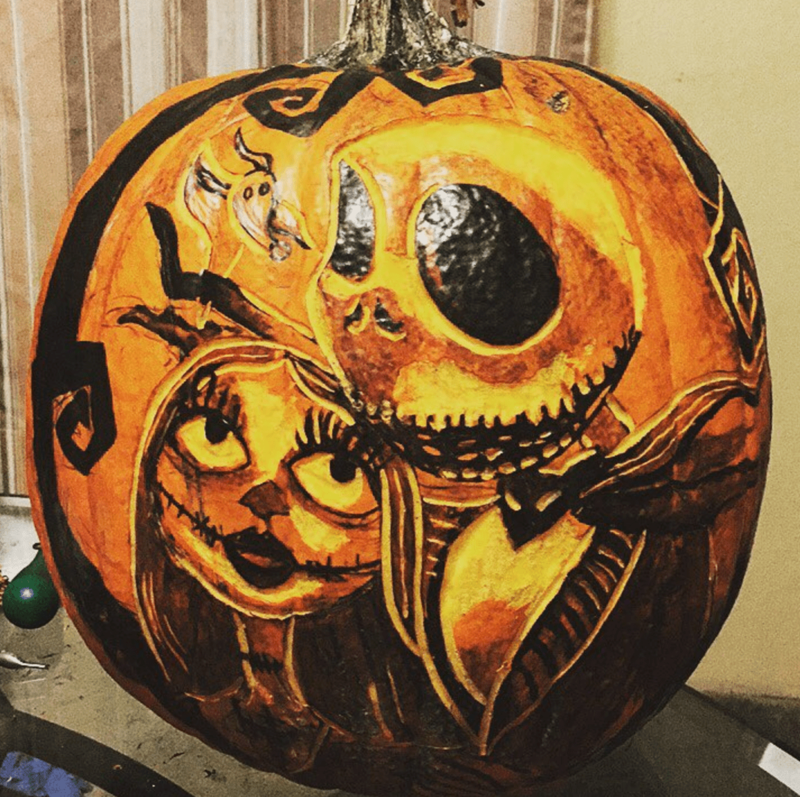 This impressive "Nightmare Before Christmas" pumpkin seen on Instagram takes a lot of skill, but it can be replicated with an online template or stencil. In order to create the sense of dimension and detail, this talented pumpkin artist used black paint in addition to a shaved technique. No matter the design, adding a bit of paint can really make your design pop. This gorgeous Día de los Muertos pumpkin may be one of the more intricate and well-done carvings ever seen. The Day of the Dead is celebrated from October 31 through November 2, making it the perfect pumpkin carving inspiration. If this idea is too difficult, a simple Sugar Skull template​ (​which you can purchase from Etsy) works just as well. This design was seen on Reddit. Layering more than one pumpkin is a great way to mix up your carving technique this year. This feisty pumpkin from Ladyface Blog is made by carving a simple jack-o'-lantern and layering the hair and tongue on top. This is a great, creative idea that even kids can try. Show your dog some love by carving his likeness into a pumpkin. This Frenchie design seen on Pinterest is a lot simpler than it looks, and just requires a bit of carving skill and some black paint. Halloween-ify your favorite Disney characters on your pumpkin this year. This slightly scary Stitch (from "Lilo and Stitch") is the perfect inspiration for your next animated pumpkin. It was posted on Pinterest. Ever dreamt of having your face on a pumpkin? If not, this incredibly lifelike pumpkin carving may change your mind. While this may be too difficult for the novice carver, using a printed template and outline can help you replicate it at home. This was posted on Reddit by OddMakerMeade. 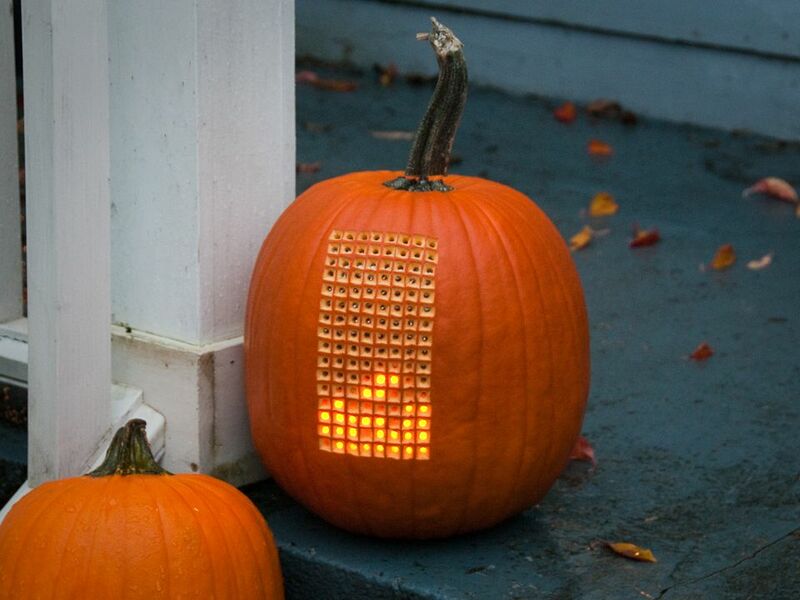 We're obsessed with this electronic Tetris pumpkin carving. The step-by-step on Colossal is definitely an undertaking, but for a fully playable pumpkin Tetris, it's oh-so-worth-it. This year marks the 20th anniversary of the Harry Potter books, so what better way to celebrate than to carve an ode to your favorite bespectacled wizard? Pair your pumpkin with a few Potter-inspired recipes for a Hogwarts-approved Halloween. This design was posted on Pinterest. Carving a creative and unique pumpkin this season doesn't have to be difficult. This fun polka dot version can be achieved using a power drill or simple hand tools. Add a little gold paint and you'll have a classy, fun pumpkin that can last far past Halloween. Wit and Whistle shows this design. "Star Wars" fans will love this Yoda pumpkin that gets every detail just right. It was shown by Clickypix. You can copy the look at home with these DIY downloadable stencils. If spooky fun is your thing on Halloween, adding a handful of toothpicks to your Jack-o'-Lantern's mouth is a low effort way to add a lot of scary to the mix. This carving is so easy, you'll be able to spend more time on baking delicious pumpkin-flavored treats. This was posted on Pinterest. Pay homage to the fearless female superhero this Halloween. Take the idea even further by pairing it with a "Wonder Woman" costume. This carving is best done by tracing the logo first, and then using a sharp knife to cut along your guidelines. This pumpkin was shown on Pinterest. This is another pumpkin that may scare the neighbor's children, but will definitely win all of your carving contests. While this carving looks difficult, using a painted styrofoam insert behind the carved pumpkin can help to steal this look, as seen on Pinterest. This amazing pumpkin is another way to show your dog just how much you love him. This fun carving doesn't cut all the way through, but instead utilizes a shaving method to create a highly detailed look. See it and more from Sparksfly Design. Once you've got the basics down, the next step to a great pumpkin is picking the right design. Fans of classic video games will love this unexpected Donkey Kong carving posted on Reddit. How about a Sonic, Mario or Pac-Man carving? Who says a Jack-o'-Lantern can't be fun AND useful? Spice up your Halloween party this year with a working pumpkin wine bottle. This step-by-step from Instructables is fairly easy to DIY in an afternoon. Just pair with spooky snacks and you'll be ready for the best Halloween shindig you've ever had. This gorgeous Tinkerbell pumpkin (as seen on Reddit) is great for kids (or kids at heart). Using an easy-to-find template, cut out the Tinkerbell outline, sprinkle a bit of fairy dust with a small power drill, light a candle and voila! Halloween shares a season with football, so why not combine your passions in a pumpkin? Show your team pride by carving a mascot, state outline or college initials into your pumpkin, as seen on this example on Pinterest. Nobody can promise that it will bring your team good luck, but it can't hurt. It's a pumpkin-eat-pumpkin world out there. Using a smaller pumpkin, this very hungry carving can easily be recreated—just make sure your Jack-o'-Lantern's mouth is wide enough to take a big bite. This fun pumpkin was seen on Reddit. If you're not ready to feed your baby pumpkins, why not eat them yourself? Another amazing homage to the 1980s, this "ET" pumpkin was seen on Instructables. Like other intricate designs, this one is best recreated with a stencil and a few sizes of carving knives. If scary faces or famous 1980s movies aren't your thing, spell it out. While this version from KustomKarvings on Instagram uses a detailed shaving technique to create the words, you could also avoid carving all together and paint your feelings on instead. The witch is to Halloween as pumpkin is to a latte, so it's no surprise people love this absolutely terrifying witch carving from Simon Patel on Instagram. This one may be too advanced for beginners, but the intricate design lends great inspiration for your original creation. This adult-friendly pumpkin is step up from a typical Jack-o'-Lantern, but it's great model for coming up with your own scary ideas. A wider mouth or angrier eyes can transform a standard carving into a frightful one. It's seen on Cool Pumpkin Designs. This pumpkin partook in a few too many cocktails. Vomiting pumpkins are incredibly easy to recreate, just make sure you save the "pumpkin guts" when you carve. This one was seen on Instagram. Halloween isn't complete without horror films like "Poltergeist," and this scary movie fan honored the Halloween tradition by carving it into a pumpkin. If you're not into television-bound ghosts, any legendary horror film will do, just make sure you keep the lights on when you come home. This pumpkin was seen on Instagram. If you're inspired by these amazing, creative carving ideas, all you need is a great set of carving knives, some creativity and a little patience to create the best pumpkin on the block.